Back with a revamped lineup, Okkervil River is primed for another long run of surprise and distinction with In the Rainbow Rain. "If December 2016 was good for anything," Will Sheff says, it was good for writing songs. "For Sheff, it was a time of contradictions. Having just completed a tour of Away, which despite its group name was effectively a solo record recorded with assorted hired guns, Sheff was on a high brought on by the gelling of Okkervil River's new touring version. At the same time, though, like many progressive-minded artists, he was shaken by his home country's political turn. With these conflicting emotions at heart, Sheff took inspiration from Quaker meetings he had been attending to begin a new collection of songs that addressed trauma and sadness while remaining open to healing and maintaining an eye towards life's promise. The result is In the Rainbow Rain, ten songs linked not by a common theme so much as a mood and musical spirit of renewal. This new record may be the band's most musically adventurous and diverse, with Sheff reveling in the creative freedom supplied by a new group of collaborators. Okkervil River 2018 features Will Graefe on guitar, Benjamin Lazar Davis on bass, Sarah Pedinotti on keyboards and backing vocals, and Cully Symington on percussion. As noted, this was the band that toured Away, and they arrived in the studio a tight unit ready to develop a new sonic palette for the band, having spent weeks bending an assortment of Sheff classics to fit their own interplay. In all, In the Rainbow Rain finds Sheff free to explore ideas and musical options that he might have felt limited in attempting with previous lineups. Opener "Famous Tracheotomies" comes across like one of Mark Kozelek's rambling stream-of-how-did-this-enter-my-consciousness songs, but it also harkens to Away's opener with its sung trivia about twists in the lives of famous people. It's an odd opener, hardly a contender for favorite concert sing-along, but it's also an example of why Sheff, like Kozelek, will always be a songwriter worth attention. His weird meanderings can leave listeners scratching their heads at one moment, then overwhelmed with empathic pathos the next.Like "Okkervil River RIP", which tied contemplations of his grandfather's death to reflections on the passing of Judee Sill and assorted members of the Force MDs, "Famous Tracheotomies" introduces listeners to an odd collection of celebrities linked by the experience of the throat surgery that saved one-and-a-half-year-old Sheff's life: Gary Coleman, Mary Wells, Dylan Thomas, and Ray Davies, whose teenaged experience inspired "Waterloo Sunset", referenced in melody here. If this odd and effective opener sets any expectation for the rest of the album, it's Sheff's ability to weave disparate elements of broader musical history into his musings and compositions. In the Rainbow Rain progresses with a collection of songs all referencing moments of the past in their sound and structure, demonstrating the depth of Sheff's love for musical styles well beyond those typically associated with his band. Sheff's songcraft takes in the whole of pop music's tropes and repurposes them in often surprising ways. "The Dream and the Light" shuffles along like a classic teen soap opera song of the 1950s then gives way to an E Street Band saxophone break. "Love Somebody" and "Shelter Song" mingle old school R&B and soft soul. "Don't Move Back to L.A." sports a countrified call and response that could be echoing from Laurel Canyon. Sheff's vocal delivery and lyrical dexterity in "External Actor" recalls a Gilbert & Sullivanesque music hall production. "Pulled Up the Ribbon" might be the most Okkervil-like song on the record; it's one of the best among the band's deep catalog, and it provides a spotlight for Pedinotti's voice and keyboards. In all, there's an upbeat vibe even when Sheff's lyrics address the darkness in our lives. 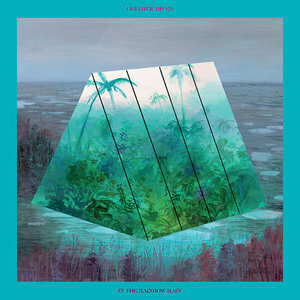 The album's cover painting shows a verdant green oasis contained within a giant triangular greenhouse surrounded by a much gloomier landscape. It's an apt metaphor for this album, released in troubling times but guided by the perpetual search for inner spiritual light. Whatever the darkness outside, this is a record that reaches for joy and brightness within. In the Rainbow Rain is unapologetic and adventurous; through it, Sheff and Co. don't ask us to ignore the world's problems, just to keep dancing in spite of them.